Welcome to our new series of love stories. At The Canary Diamond Co, we celebrate love every day. Weddings, engagements, anniversaries, the birth of your first child, Mother’s Day… It is such a privilege to be a part of these love stories — between couples, mothers and daughters, sisters, friends, etc — love stories which we are stoked to be sharing with you. Enjoy. The greatest love stories ever told are often those that are rife with drama. Romeo and Juliet. Carrie and Big. Elizabeth Taylor and Richard Burton. Rose and Jack. Belle and the Beast… After all, the Bard himself did warn us that the course of true love never did run smooth. 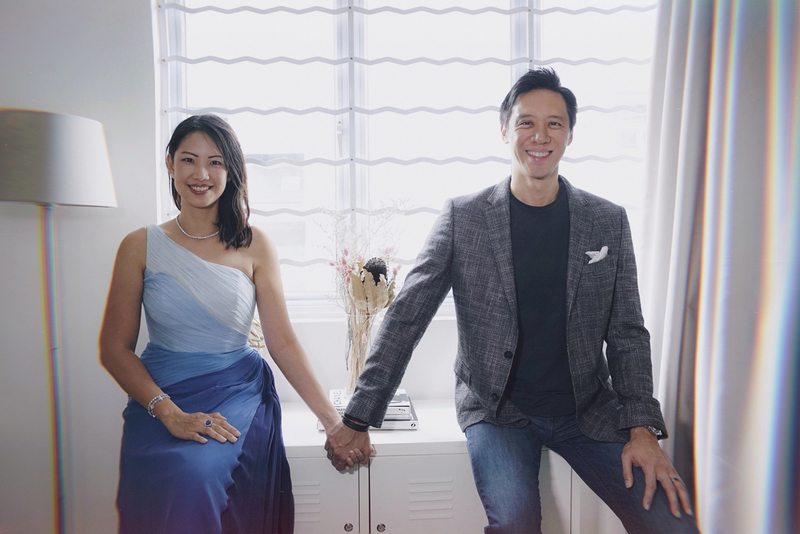 While these stories are hard to compete with, the protagonists of our love story this month, Darrell Chan and Cheryl Chia, have had their fair share of drama during their courtship. If we’re being dramatic, Darrell’s first impression of Cheryl at 16 — “She reminded me of Claire Danes in Romeo and Juliet.” — might have been the harbinger of their will-they-won’t-they romance years later. Thank goodness, unlike Shakespeare’s ill-fated, star-crossed lovers, Darrell and Cheryl are now living their happily-ever-after, 12 years and counting. Cheryl: We first met when we were teenagers at church. I think we were just 15 or 16. Cheryl: I didn’t have much of an impression of him. I just recognised him as the tall guy who sang on stage at church. Darrell: Cheryl had a cute, girl-next-door look which I loved. In fact, she reminded me of Claire Danes in Romeo and Juliet. She was always smiling and she carried this amazing energy wherever she went – it was pretty magnetic. Cheryl: We reconnected in 2003 and chatted occasionally in church about work. I remember sending him an email to see how his work was going. He replied and asked me out to lunch. I said yes — I thought it was a casual lunch between friends. Whereas Darrell, I found out much later, had told a close friend that he was really excited about the lunch because he thought it could be something special. Cheryl: We spent more than five hours just talking and laughing about everything over lunch. What three qualities about him/her are you most attracted to? Cheryl: His wisdom, his kind heart and that dreamy bass voice. Darrell: Cheryl has an incredible ability to care for friends and family. She also has a vivacious personality that has made the past 12 years of our marriage an amazing adventure. Oh, and her eyes – her perfect almond-shaped eyes are kind and full of life. Tell us about the proposal. Was it a surprise? Cheryl: This story is not without its drama. Right from the beginning of our relationship, Darrell was pretty certain that I was the one he wanted to marry. For me, I enjoyed spending time together, but I wasn’t at first sure if I could see myself spending the rest of my life with him. The certainty came only after a period of serious reflection and prayer. Unfortunately, by the time I was sure, Darrell’s conviction had wavered because of my mixed signals and indecision. That went on for a while until one of Darrell’s closest friends, who thought we were perfect for each other, questioned why we weren’t getting married already. I conveyed his sentiment to Darrell the day after, and it sparked a whole torrent of debate. Eventually, we realised that to spend the rest of our lives together is what we both wanted. Right there and then at Starbucks, we decided that we would get married — no ring, no fuss, no surprise – just a mutual agreement in true lawyer fashion. That said, Darrell being the romantic he is, an engagement without a “proper proposal” with a ring was just not his style. Three months after our “agreement”, when we were in Sydney with some friends, he took me for a walk along Rose Bay very casually. I did not know this at the time, but he had a seaplane booked, and somehow managed to convince me — person with a fear of height — to go to the jetty and on to the plane. The view of Sydney from up there was breathtaking. I was admiring it when he took out the ring box and presented me with a gorgeous trilogy ring with the sweetest inscription inside. I was completely surprised, I didn’t expect it at all since our wedding preparations were already in full swing by then. The surprise continued with the arrival of a private boat which took us to Watson’s Bay for a celebratory lunch. It was perfect. Cheryl, what is the most memorable and meaningful piece of jewellery you have received from Darrell? A tanzanite ring. Darrell had just received his first meaningful bonus at work. Instead of buying himself something, the first thing he did was to make a secret trip to The Canary Diamond to buy me something nice. He was so excited when he came home with the beautiful ring set with a gorgeous unheated tanzanite. He knew how much I love the colour and design. He wanted to thank me for being supportive of him no matter where he was in his career. I was so touched. Darrell, you bought Cheryl a beautiful piece from The Canary Diamond for your 10th year anniversary. Can you tell us about it? I wanted this piece to be significant. I looked at a few designs, but I didn’t feel that any of those rings truly represented our relationship. I wanted 10 diamonds to represent the decade we have spent together as husband and wife. After discussing with your team, I was set on a ring with five asscher-cut diamonds lined up in a row on the top of the band which tapered down to five smaller round diamonds below. I thought it was a fantastic representation of how our relationship had grown more beautiful over the decade. What would you say is one of the most memorable moments you have together? Cheryl: Singing a duet of This is the Day by Scott Wesley Brown as our walk-in song at our wedding dinner. It was the first of many duets to come. Darrell: The most memorable one was definitely when the doors of the church opened on our wedding day, and I saw Cheryl walk down the aisle. My heart was in my mouth, and it was probably the most emotionally-intense moment I’ve had. The ceremony was deeply meaningful and memorable, it was also probably the most pivotal moment of my life. Be spontaneous: What is one thing you’d really like to say to him/her right now? Cheryl: Thank you for being my absolute rock and for bringing so much love, joy and laughter into my life. You are my biggest blessing! Darrell: The past 12 years have been such an incredible adventure, and I cannot imagine this lifetime without you in it. You fill each day with delight and love, I love you so much!